Two discussions resulted in more information about objects at the University of Aberdeen. 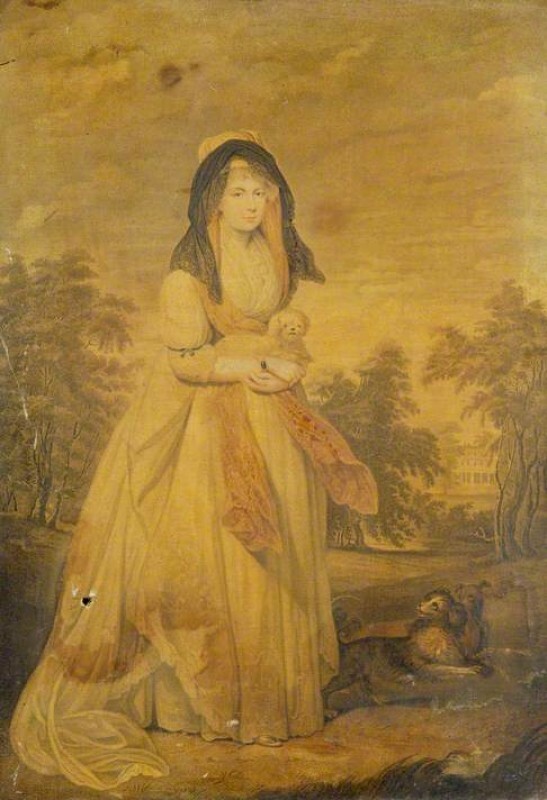 Andrea Kollman noted that Woman with Dog, 1750, by an unknown artist, is ‘ actually a copy after William Beechey's portrait of Queen Charlotte (1744–1818), of which there are a number of versions’, meaning 1750 was clearly not the correct execution date. Pieter van der Merwe also started a discussion about another work in the collection, The Port of Gibraltar by an unknown artist, undated: it looked to be a version or a copy of another Gibraltar oil attributed to Henry Aston Barker. The view was taken from the end of the ‘Devil's Tongue’ battery, and made up an entirely circular view in which spectators stood surrounded by some 10,000 square feet of canvas. Pieter sought more examples of Barker’s oils. After closer inspection, both works were found to be paper, or doctored prints laid on canvas. Barker was also determined to not really be an oil painter: the title of the work changed to View of Gibraltar, taken by Henry Aston Barker, from the Devil's Tongue Battery, in September 1804. The ‘Woman with a Dog’ was agreed to be a print after the 1812 portrait by William Beechey. The prints were removed from Art UK temporarily, until works on paper begin to be included later in 2016. In the meantime, images of the works are listed on this page. Is this painting after Henry Aston Barker? Are there other examples of his work in oil? When was this portrait of Queen Charlotte, after William Beechey, painted?